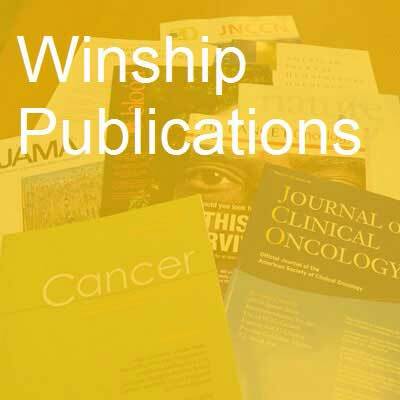 Various first authors and senior authors from Winship Cancer Institute have published 116 studies in major medical and scientific journals in the past month. Home environments, physical activity, and energy expenditure among low-income overweight and obese women. Kegler MC, Haardörfer R, Alcantara I, Gazmararian JA, Gemma A, Reynolds P, Morris C. Women & health. 2017; 57(8):990-1006. PubMed PMID: 27617594. A phase 2 trial of alisertib in patients with relapsed or refractory B-cellnon-Hodgkin lymphoma. Cohen JB, Maddocks KJ, Huang Y, Christian BA, Jaglowski SM, Flowers CR, Blum KA. Leukemia & lymphoma. 2017; 58(9):1-2. PubMed PMID: 28278718; PubMed Central PMCID: PMC5497734. Ancillary testing strategies in salivary gland aspiration cytology: A practical pattern-based approach. Griffith CC, Siddiqui MT, Schmitt AC. Diagnostic cytopathology. 2017; 45(9):808-819. PubMed PMID: 28411379. Corrigendum to "Plasma metabolomics in adults with cystic fibrosis during a pulmonary exacerbation: A pilot randomized study of high-dose vitamin D3 administration" [Metabolism vol. 70, May 2017, pages 31-41]. Alvarez JA, Chong EY, Walker DI, Chandler JD, Michalski ES, Grossmann RE, Uppal K, Li S, Frediani JK, Tirouvanziam R, Tran VT, Tangpricha V, Jones DP, Ziegler TR. Metabolism: clinical and experimental. 2017; 74:41-42. PubMed PMID: 28456337. Prognostic modeling in diffuse large B-cell lymphoma in the era of immunochemotherapy: Where do we go from here? Koff JL, Flowers CR. Cancer. 2017; 123(17):3222-3225. PubMed PMID: 28464215. The Impact of Fatigue on Satisfaction of Search in Chest Radiography. Krupinski EA, Berbaum KS, Schartz KM, Caldwell RT, Madsen MT. Academic radiology. 2017; 24(9):1058-1063. PubMed PMID: 28549868; PubMed Central PMCID: PMC5557668. Surgical innovation. Kooby DA. Journal of surgical oncology. 2017; 116(4):470. PubMed PMID: 28628719. Appendiceal Mucinous Neoplasms: Diagnosis and Management. Shaib WL, Assi R, Shamseddine A, Alese OB, Staley 3rd C, Memis B, Adsay V, Bekaii-Saab T, El-Rayes BF. The oncologist. 2017; 22(9):1107-1116. PubMed PMID: 28663356; PubMed Central PMCID: PMC5599200. The importance of immunization in cancer prevention, treatment, and survivorship. Ward EM, Flowers CR, Gansler T, Omer SB, Bednarczyk RA. CA: a cancer journal for clinicians. 2017; 67(5):398-410. PubMed PMID: 28753241. CRISPR: Established Editor of Human Embryos? Li XJ, Tu Z, Yang W, Li S. Cell stem cell. 2017; 21(3):295-296. PubMed PMID: 28886363. Refining the predictors of outcome in patients with resectable esophageal cancer. Saba NF. Cancer. 2017; PubMed PMID: 28885686. Folate dietary insufficiency and folic acid supplementation similarly impair metabolism and compromise hematopoiesis. Henry CJ, Nemkov T, Casas-Selves M, Bilousova G, Zaberezhnyy V, Higa KC, Serkova NJ, Hansen KC, D' Alessandro A, DeGregori J. Haematologica. 2017; PubMed PMID: 28883079. Evidence for biochemical barrier restoration: Topical solenopsin analogs improve inflammation and acanthosis in the KC-Tie2 mouse model of psoriasis. Arbiser JL, Nowak R, Michaels K, Skabytska Y, Biedermann T, Lewis MJ, Bonner MY, Rao S, Gilbert LC, Yusuf N, Karlsson I, Fritz Y, Ward NL. Scientific reports. 2017; 7(1):11198. PubMed PMID: 28894119; PubMed Central PMCID: PMC5593857. Science of Biosimilars. Harvey RD. Journal of oncology practice. 2017; 13(9_suppl):17s-23s. PubMed PMID: 28898589. Concomitant chemotherapy and radiotherapy with SBRT Boost for Unresectable, Stage III Non-small Cell Lung Cancer: A phase I Study. Higgins KA, Pillai RN, Chen Z, Tian S, Zhang C, Patel P, Pakkala S, Shelton J, Force SD, Fernandez FG, Steuer CE, Owonikoko TK, Ramalingam SS, Bradley JD, Curran WJ. Journal of thoracic oncology : official publication of the International Association for the Study of Lung Cancer. 2017; PubMed PMID: 28919394. The Harm Done to Reproducibility by the Culture of Null Hypothesis Significance Testing. Lash TL. American journal of epidemiology. 2017; 186(6):627-635. PubMed PMID: 28938715. Lash Responds to "Is Reproducibility Thwarted by Hypothesis Testing?" and "The Need for Cognitive Science in Methodology". Lash TL. American journal of epidemiology. 2017; 186(6):646-647. PubMed PMID: 28938714. Exclusive and partial enteral nutrition for Crohn's disease - Authors' reply. Kugathasan S, Denson LA, Hyams JS. Lancet (London, England). 2017; 390(10101):1486-1487. PubMed PMID: 28952446. Erratum to: draft sequencing and assembly of the genome of the world's largest fish, the whale shark: Rhincodon typus smith 1828. Read TD, Petit 3rd RA, Joseph SJ, Alam T, Weil MR, Ahmad M, Bhimani R, Vuong JS, Haase CP, Webb DH, Tan M, Dove ADM. BMC genomics. 2017; 18(1):755. PubMed PMID: 28946861. Patients with Intermediate Risk Prostate Cancer May be Good Candidates for Active Surveillance: Pro. Sanda MG. The Journal of urology. 2017; PubMed PMID: 28947083. Neurodevelopmental model of long-term outcomes of adult survivors of childhood brain tumors. King TZ, Ailion AS, Fox ME, Hufstetler SM. Child neuropsychology : a journal on normal and abnormal development in childhood and adolescence. 2017; :1-21. PubMed PMID: 28956496. Comparison of the toxicity profile of PD-1 versus PD-L1 inhibitors in non-small cell lung cancer: A systematic analysis of the literature. Pillai RN, Behera M, Owonikoko TK, Kamphorst AO, Pakkala S, Belani CP, Khuri FR, Ahmed R, Ramalingam SS. Cancer. 2017; PubMed PMID: 28960263. Capitalizing on Social Media for Career Development. Escoffery C, Kenzig M, Hyden C, Hernandez K. Health promotion practice. 2017; :1524839917734522. PubMed PMID: 28962538. Collective Approach to Advancing C-H Functionalization. Davies HML, Morton D. ACS central science. 2017; 3(9):936-943. PubMed PMID: 28979934; PubMed Central PMCID: PMC5620983. GRB7 Expression and Correlation With HER2 Amplification in Invasive Breast Carcinoma. Bivin WW, Yergiyev O, Bunker ML, Silverman JF, Krishnamurti U. Applied immunohistochemistry & molecular morphology : AIMM. 2017; 25(8):553-558. PubMed PMID: 26945445. Concurrent myeloid sarcoma, atypical teratoid/rhabdoid tumor, and hypereosinophilia in an infant with a germline SMARCB1 mutation. Metts JL, Park SI, Soares BP, Fong C, Biegel JA, Goldsmith KC. Pediatric blood & cancer. 2017; 64(9). PubMed PMID: 28111898. Three-dimensional power Doppler ultrasound in the early assessment of response to concurrent chemo-radiotherapy for advanced cervical cancer. Xu Y, Zhu L, Ru T, Wang H, He J, Zhou Z, Yang X. Acta radiologica (Stockholm, Sweden : 1987). 2017; 58(9):1147-1154. PubMed PMID: 28068824. Risk factors and surveillance for reduced bone mineral density in pediatric cancer survivors. Siegel DA, Claridy M, Mertens A, George E, Vangile K, Simoneaux SF, Meacham LR, Wasilewski-Masker K. Pediatric blood & cancer. 2017; 64(9). PubMed PMID: 28233475. Using multiple biomarkers and determinants to obtain a better measurement of oxidative stress: a latent variable structural equation model approach. Eldridge RC, Flanders WD, Bostick RM, Fedirko V, Gross M, Thyagarajan B, Goodman M. Biomarkers : biochemical indicators of exposure, response, and susceptibility to chemicals. 2017; 22(6):517-524. PubMed PMID: 28298141. Stereotactic Body Radiotherapy for Early-stage Non-small-cell Lung Cancer in Patients 80 Years and Older: A Multi-center Analysis. Cassidy RJ, Patel PR, Zhang X, Press RH, Switchenko JM, Pillai RN, Owonikoko TK, Ramalingam SS, Fernandez FG, Force SD, Curran WJ, Higgins KA. Clinical lung cancer. 2017; 18(5):551-558.e6. PubMed PMID: 28373068. Unmet needs in the first-line treatment of follicular lymphoma. Casulo C, Nastoupil L, Fowler NH, Friedberg JW, Flowers CR. Annals of oncology : official journal of the European Society for Medical Oncology. 2017; 28(9):2094-2106. PubMed PMID: 28430865. Concurrent chemoradiotherapy with or without surgery for patients with resectable esophageal cancer: An analysis of the National Cancer Data Base. Naik KB, Liu Y, Goodman M, Gillespie TW, Pickens A, Force SD, Steuer CE, Owonikoko TK, Ramalingam SS, Higgins K, Beitler JJ, Shin DM, Willingham FF, El-Rayes B, Landry JC, Fernandez FG, Saba NF. Cancer. 2017; 123(18):3476-3485. PubMed PMID: 28464264. Circulating insulin-like growth factor-related biomarkers: Correlates and responses to calcium supplementation in colorectal adenoma patients. Um CY, Fedirko V, Flanders WD, Höflich C, Wirthgen E, Bostick RM. Molecular carcinogenesis. 2017; 56(9):2127-2134. PubMed PMID: 28467661; PubMed Central PMCID: PMC5546991. Outcomes for patients with locally advanced pancreatic adenocarcinoma treated with stereotactic body radiation therapy versus conventionally fractionated radiation. Zhong J, Patel K, Switchenko J, Cassidy RJ, Hall WA, Gillespie T, Patel PR, Kooby D, Landry J. Cancer. 2017; 123(18):3486-3493. PubMed PMID: 28493288; PubMed Central PMCID: PMC5589506. Increased Pretransplant Frequency of CD28(+) CD4(+) TEM Predicts Belatacept-Resistant Rejection in Human Renal Transplant Recipients. Cortes-Cerisuelo M, Laurie SJ, Mathews DV, Winterberg PD, Larsen CP, Adams AB, Ford ML. American journal of transplantation : official journal of the American Society of Transplantation and the American Society of Transplant Surgeons. 2017; 17(9):2350-2362. PubMed PMID: 28502091; PubMed Central PMCID: PMC5599135. Supported lipid bilayer platforms to probe cell mechanobiology. Glazier R, Salaita K. Biochimica et biophysica acta. 2017; 1859(9 Pt A):1465-1482. PubMed PMID: 28502789; PubMed Central PMCID: PMC5531615. Immune Correlates of GM-CSF and Melanoma Peptide Vaccination in a Randomized Trial for the Adjuvant Therapy of Resected High-Risk Melanoma (E4697). Butterfield LH, Zhao F, Lee S, Tarhini AA, Margolin KA, White RL, Atkins MB, Cohen GI, Whiteside TL, Kirkwood JM, Lawson DH. Clinical cancer research : an official journal of the American Association for Cancer Research. 2017; 23(17):5034-5043. PubMed PMID: 28536308; PubMed Central PMCID: PMC5581724. Activation of Protein Kinase C ε in Merkel Cell Polyomavirus-Induced Merkel Cell Carcinoma. Costa A, Mackelfresh J, Gilbert L, Bonner MY, Arbiser JL. JAMA dermatology. 2017; 153(9):931-932. PubMed PMID: 28564697. Novel mouse models of oculopharyngeal muscular dystrophy (OPMD) reveal early onset mitochondrial defects and suggest loss of PABPN1 may contribute to pathology. Vest KE, Phillips BL, Banerjee A, Apponi LH, Dammer EB, Xu W, Zheng D, Yu J, Tian B, Pavlath GK, Corbett AH. Human molecular genetics. 2017; 26(17):3235-3252. PubMed PMID: 28575395. Detection of Head and Neck Cancer in Surgical Specimens Using Quantitative Hyperspectral Imaging. Lu G, Little JV, Wang X, Zhang H, Patel MR, Griffith CC, El-Deiry MW, Chen AY, Fei B. Clinical cancer research : an official journal of the American Association for Cancer Research. 2017; 23(18):5426-5436. PubMed PMID: 28611203. Cytologic predictors of malignancy in bile duct brushings: a multi-reviewer analysis of 60 cases. Avadhani V, Hacihasanoglu E, Memis B, Pehlivanoglu B, Hanley KZ, Krishnamurti U, Krasinskas AM, Osunkoya AO, Daniels LM, Freedman AA, Goodman M, Adsay V, Reid MD. Modern pathology : an official journal of the United States and Canadian Academy of Pathology, Inc. 2017; 30(9):1273-1286. PubMed PMID: 28664934. Biliary reconstruction options for bile duct stricture in patients with prior Roux-en-Y reconstruction. Shah MM, Martin BM, Stetler JL, Patel AD, Davis SS, Lin E, Sarmiento JM. Surgery for obesity and related diseases : official journal of the American Society for Bariatric Surgery. 2017; 13(9):1629-1634. PubMed PMID: 28687243. Outcomes and Cost Analysis of Surveillance Strategies After Initial Treatment for Women With Recurrent Ovarian Cancer. Alexander VM, Gordon AN, Howard DH, Khanna N. International journal of gynecological cancer : official journal of the International Gynecological Cancer Society. 2017; 27(7):1333-1342. PubMed PMID: 28692633. Integrating Next-Generation Genomic Sequencing and Mass Spectrometry To Estimate Allele-Specific Protein Abundance in Human Brain. Wingo TS, Duong DM, Zhou M, Dammer EB, Wu H, Cutler DJ, Lah JJ, Levey AI, Seyfried NT. Journal of proteome research. 2017; 16(9):3336-3347. PubMed PMID: 28691493. Epigenome-wide association of PTSD from heterogeneous cohorts with a common multi-site analysis pipeline. Ratanatharathorn A, Boks MP, Maihofer AX, Aiello AE, Amstadter AB, Ashley-Koch AE, Baker DG, Beckham JC, Bromet E, Dennis M, Garrett ME, Geuze E, Guffanti G, Hauser MA, Kilaru V, Kimbrel NA, Koenen KC, Kuan PF, Logue MW, Luft BJ, Miller MW, Mitchell C, Nugent NR, Ressler KJ, Rutten BPF, Stein MB, Vermetten E, Vinkers CH, Youssef NA, , Uddin M, Nievergelt CM, Smith AK. American journal of medical genetics. Part B, Neuropsychiatric genetics : the official publication of the International Society of Psychiatric Genetics. 2017; 174(6):619-630. PubMed PMID: 28691784; PubMed Central PMCID: PMC5592721. A Model for Epigenetic Inhibition via Transvection in the Mouse. Rodriguez JD, Myrick DA, Falciatori I, Christopher MA, Lee TW, Hannon GJ, Katz DJ. Genetics. 2017; 207(1):129-138. PubMed PMID: 28696215; PubMed Central PMCID: PMC5586367. Conserved hydrophobic residues in the CARP/β-sheet domain of cyclase-associated protein are involved in actin monomer regulation. Iwase S, Ono S. Cytoskeleton (Hoboken, N.J.). 2017; 74(9):343-355. PubMed PMID: 28696540. Vitamin D Status Is Associated with Hepcidin and Hemoglobin Concentrations in Children with Inflammatory Bowel Disease. Syed S, Michalski ES, Tangpricha V, Chesdachai S, Kumar A, Prince J, Ziegler TR, Suchdev PS, Kugathasan S. Inflammatory bowel diseases. 2017; 23(9):1650-1658. PubMed PMID: 28700535. An Esterase-Sensitive Prodrug Approach for Controllable Delivery of Persulfide Species. Zheng Y, Yu B, Li Z, Yuan Z, Organ CL, Trivedi RK, Wang S, Lefer DJ, Wang B. Angewandte Chemie (International ed. in English). 2017; 56(39):11749-11753. PubMed PMID: 28700817. Translation is actively regulated during the differentiation of CD8(+) effector T cells. Araki K, Morita M, Bederman AG, Konieczny BT, Kissick HT, Sonenberg N, Ahmed R. Nature immunology. 2017; 18(9):1046-1057. PubMed PMID: 28714979. Reply to Á. Benedict et al. Kohn CG, Zeichner SB, Chen Q, Montero AJ, Goldstein DA, Flowers CR. Journal of clinical oncology : official journal of the American Society of Clinical Oncology. 2017; 35(26):3086-3087. PubMed PMID: 28715248. Frailty and cancer: Implications for oncology surgery, medical oncology, and radiation oncology. Ethun CG, Bilen MA, Jani AB, Maithel SK, Ogan K, Master VA. CA: a cancer journal for clinicians. 2017; 67(5):362-377. PubMed PMID: 28731537. Are oral and maxillofacial surgery residents being adequately trained to care for pediatric patients? Abramowicz S, Kaban LB, Wurtzel AS, Roser SM. Oral surgery, oral medicine, oral pathology and oral radiology. 2017; 124(3):220-224. PubMed PMID: 28735860. Systemic Error in Radiology. Waite S, Scott JM, Legasto A, Kolla S, Gale B, Krupinski EA. AJR. American journal of roentgenology. 2017; 209(3):629-639. PubMed PMID: 28742381. CCL3 is a key mediator for the leukemogenic effect of Ptpn11-activating mutations in the stem-cell microenvironment. Dong L, Zheng H, Qu CK. Blood. 2017; 130(12):1471-1474. PubMed PMID: 28751523. Ethnophytotechnology: Harnessing the Power of Ethnobotany with Biotechnology. de la Parra J, Quave CL. Trends in biotechnology. 2017; 35(9):802-806. PubMed PMID: 28751146. The Society of Thoracic Surgeons Congenital Heart Surgery Database: 2017 Update on Research. Jacobs ML, Jacobs JP, Hill KD, Hornik C, O'Brien SM, Pasquali SK, Vener D, Kumar SR, Habib RH, Shahian DM, Edwards FH, Fernandez FG. The Annals of thoracic surgery. 2017; 104(3):731-741. PubMed PMID: 28760477. Cutting Edge: 2B4-Mediated Coinhibition of CD4(+) T Cells Underlies Mortality in Experimental Sepsis. Chen CW, Mittal R, Klingensmith NJ, Burd EM, Terhorst C, Martin GS, Coopersmith CM, Ford ML. Journal of immunology (Baltimore, Md. : 1950). 2017; 199(6):1961-1966. PubMed PMID: 28768726; PubMed Central PMCID: PMC5587400. Novel immunohistochemistry-based signatures to predict metastatic site of triple-negative breast cancers. Klimov S, Rida PC, Aleskandarany MA, Green AR, Ellis IO, Janssen EA, Rakha EA, Aneja R. British journal of cancer. 2017; 117(6):826-834. PubMed PMID: 28720841; PubMed Central PMCID: PMC5589983. Centrosome amplification: a suspect in breast cancer and racial disparities. Ogden A, Rida PCG, Aneja R. Endocrine-related cancer. 2017; 24(9):T47-T64. PubMed PMID: 28515047. Local and Systemic Expression of Immunomodulatory Factors in Chronic Pancreatitis. Komar HM, Hart PA, Cruz-Monserrate Z, Conwell DL, Lesinski GB. Pancreas. 2017; 46(8):986-993. PubMed PMID: 28796136. 50 years on … the discovery of tubulin continues to advance cancer treatment. Crasta K, Aneja R. Endocrine-related cancer. 2017; 24(9):E3-E5. PubMed PMID: 28808042. Blockade of Asparagine Endopeptidase Inhibits Cancer Metastasis. Qi Q, Obianyo O, Du Y, Fu H, Li S, Ye K. Journal of medicinal chemistry. 2017; 60(17):7244-7255. PubMed PMID: 28820254. Delta-Secretase Phosphorylation by SRPK2 Enhances Its Enzymatic Activity, Provoking Pathogenesis in Alzheimer's Disease. Wang ZH, Liu P, Liu X, Manfredsson FP, Sandoval IM, Yu SP, Wang JZ, Ye K. Molecular cell. 2017; 67(5):812-825.e5. PubMed PMID: 28826672. Nitric oxide stimulates cellular degradation of human CYP51A1, the highly conserved lanosterol 14α-demethylase. Park JW, Byrd A, Lee CM, Morgan ET. The Biochemical journal. 2017; 474(19):3241-3252. PubMed PMID: 28830911. Esterase-sensitive sulfur dioxide prodrugs inspired by modified Julia olefination. Wang W, Wang B. Chemical communications (Cambridge, England). 2017; 53(73):10124-10127. PubMed PMID: 28840924. Reply. Medbery RL, Fernandez FG. The Annals of thoracic surgery. 2017; 104(3):1098. PubMed PMID: 28838495. Differential HspBP1 expression accounts for the greater vulnerability of neurons than astrocytes to misfolded proteins. Zhao T, Hong Y, Yin P, Li S, Li XJ. Proceedings of the National Academy of Sciences of the United States of America. 2017; 114(37):E7803-E7811. PubMed PMID: 28847953; PubMed Central PMCID: PMC5604039. Generation of Clickable Pittsburgh Compound B for the Detection and Capture of β-Amyloid in Alzheimer's Disease Brain. Diner I, Dooyema J, Gearing M, Walker LC, Seyfried NT. Bioconjugate chemistry. 2017; PubMed PMID: 28862836. Synthesis and C-H Functionalization Chemistry of Thiazole-Semicoronenediimides (TsCDIs) and -Coronenediimides (TCDIs). Shi Q, Andreansky ES, Marder SR, Blakey SB. The Journal of organic chemistry. 2017; PubMed PMID: 28885844. Changes in Insurance Coverage and Stage at Diagnosis Among Nonelderly Patients With Cancer After the Affordable Care Act. Jemal A, Lin CC, Davidoff AJ, Han X. Journal of clinical oncology : official journal of the American Society of Clinical Oncology. 2017; :JCO2017737817. PubMed PMID: 28885865. Rhodium- and Non-Metal-Catalyzed Approaches for the Conversion of Isoxazol-5-ones to 2,3-Dihydro-6H-1,3-oxazin-6-ones. Jurberg ID, Davies HML. Organic letters. 2017; PubMed PMID: 28892631. The Oncologic Impact of Postoperative Complications Following Resection of Truncal and Extremity Soft Tissue Sarcomas. Broecker JS, Ethun CG, Monson DK, Lopez-Aguiar AG, Le N, McInnis M, Godette K, Reimer NB, Oskouei SV, Delman KA, Staley CA, Maithel SK, Cardona K. Annals of surgical oncology. 2017; PubMed PMID: 28895084. Multimodality Radionuclide Imaging in a Patient With Hereditary Paraganglioma-Pheochromocytoma Syndrome. Yim SY, Moncayo VM, Pasquel FJ, Halkar RK. Clinical nuclear medicine. 2017; PubMed PMID: 28902732. The Agony of It All: Musculoskeletal Discomfort in the Reading Room. Seidel RL, Krupinski EA. Journal of the American College of Radiology : JACR. 2017; PubMed PMID: 28899700. Detection of Dysferlin Gene Pathogenic Variants in the Indian Population in Patients Predicted to have a Dysferlinopathy Using a Blood-based Monocyte Assay and Clinical Algorithm: A Model for Accurate and Cost-effective Diagnosis. Dastur RS, Gaitonde PS, Kachwala M, Nallamilli BRR, Ankala A, Khadilkar SV, Atchayaram N, Gayathri N, Meena AK, Rufibach L, Shira S, Hegde M. Annals of Indian Academy of Neurology. 2017; 20(3):302-308. PubMed PMID: 28904466; PubMed Central PMCID: PMC5586129. Response to Letter: "Calcium and Bone Turnover Markers in Acromegaly: A Prospective, Controlled Study". Constantin T, Tangpricha V, Shah R, Oyesiku NM, Ioachimescu O, Ritchie J, Ioachimescu AG. The Journal of clinical endocrinology and metabolism. 2017; 102(9):3561-3562. PubMed PMID: 28911163. Regioselective Intermolecular Allylic C-H Amination of Disubstituted Olefins via Rh-π-allyl Intermediates. Burman JS, Blakey SB. Angewandte Chemie (International ed. in English). 2017; PubMed PMID: 28913956. Predictive and prognostic value of intravoxel incoherent motion (IVIM) MR imaging in patients with advanced cervical cancers undergoing concurrent chemo-radiotherapy. Wang H, Zhu L, Meng J, Xu Y, Liu B, Chen W, He J, Zhou Z, Yang X. Scientific reports. 2017; 7(1):11635. PubMed PMID: 28912536; PubMed Central PMCID: PMC5599638. The Expanded Use of Auto-augmentation Techniques in Oncoplastic Breast Surgery. Losken A, Hart AM, Dutton JW, Broecker JS, Styblo TM, Carlson GW. Plastic and reconstructive surgery. 2017; PubMed PMID: 28915209. Predicting clinical outcomes from large scale cancer genomic profiles with deep survival models. Yousefi S, Amrollahi F, Amgad M, Dong C, Lewis JE, Song C, Gutman DA, Halani SH, Vega JEV, Brat DJ, Cooper LAD. Scientific reports. 2017; 7(1):11707. PubMed PMID: 28916782; PubMed Central PMCID: PMC5601479. Early blood stream infection following allogeneic hematopoietic stem cell transplantation is a risk factor for acute grade III-IV GVHD in children and adolescents. Sano H, Hilinski JA, Qayed M, Applegate K, Newton JG, Watkins B, Chiang KY, Horan J. Pediatric blood & cancer. 2017; PubMed PMID: 28921804. Detection and delineation of squamous neoplasia with hyperspectral imaging in a mouse model of tongue carcinogenesis. Lu G, Wang D, Qin X, Muller S, Wang X, Chen AY, Chen ZG, Fei B. Journal of biophotonics. 2017; PubMed PMID: 28921845. TrkB neurotrophic activities are blocked by α-synuclein, triggering dopaminergic cell death in Parkinson's disease. Kang SS, Zhang Z, Liu X, Manfredsson FP, Benskey MJ, Cao X, Xu J, Sun YE, Ye K. Proceedings of the National Academy of Sciences of the United States of America. 2017; PubMed PMID: 28923922. 14-3-3ζ binds the proteasome, limits proteolytic function, and enhances sensitivity to proteasome inhibitors. Gu Y, Xu K, Torre C, Samur M, Barwick BG, Rupji M, Arora J, Neri P, Kaufman J, Nooka A, Bernal-Mizrachi L, Vertino P, Sun SY, Chen J, Munshi N, Fu H, Kowalski J, Boise LH, Lonial S. Leukemia. 2017; PubMed PMID: 28924240. Safety and efficacy of coaxial lumen-apposing metal stents in the management of refractory gastrointestinal luminal strictures: a multicenter study. Bazerbachi F, Heffley JD, Abu Dayyeh BK, Nieto J, Vargas EJ, Sawas T, Zaghlol R, Buttar NS, Topazian MD, Wong Kee Song LM, Levy M, Keilin S, Cai Q, Willingham FF. Endoscopy international open. 2017; 5(9):E861-E867. PubMed PMID: 28924591; PubMed Central PMCID: PMC5595583. MANF regulates hypothalamic control of food intake and body weight. Yang S, Yang H, Chang R, Yin P, Yang Y, Yang W, Huang S, Gaertig MA, Li S, Li XJ. Nature communications. 2017; 8(1):579. PubMed PMID: 28924165; PubMed Central PMCID: PMC5603516. Copper Sulfide Perfluorocarbon Nanodroplets as Clinically Relevant Photoacoustic/Ultrasound Imaging Agents. Santiesteban DY, Dumani DS, Profili D, Emelianov SY. Nano letters. 2017; PubMed PMID: 28926263. The relationship between physical activity, obesity, and lung cancer risk by smoking status in a large prospective cohort of US adults. Patel AV, Carter BD, Stevens VL, Gaudet MM, Campbell PT, Gapstur SM. Cancer causes & control : CCC. 2017; PubMed PMID: 28940119. Promoting intolerance: learning from warts. Rao S, Arbiser JL. The British journal of dermatology. 2017; 177(3):621-622. PubMed PMID: 28940266. Psychosocial and cessation-related differences between tobacco-marijuana co-users and single product users in a college student population. Masters MN, Haardörfer R, Windle M, Berg C. Addictive behaviors. 2017; 77:21-27. PubMed PMID: 28941933. Prognostic biomarkers in patients with human immunodeficiency virus-positive disease with head and neck squamous cell carcinoma. Zhang H, Kim S, Chen Z, Nannapaneni S, Chen AY, Moore CE, Sica G, Mosunjac M, Nguyen MLT, D'Souza G, Carey TE, Peterson LA, McHugh JB, Graham M, Komarck CM, Wolf GT, Walline HM, Bellile E, Riddell 4th J, Pai SI, Sidransky D, Westra WH, William Jr WN, Lee JJ, El-Naggar AK, Ferris RL, Seethala R, Grandis JR, Chen ZG, Saba NF, Shin DM, . Head & neck. 2017; PubMed PMID: 28945296. Diagnostic accuracy of teledermatology for nonmelanoma skin cancer: Can patients be referred directly for surgical management? Cotes ME, Albers LN, Sargen M, Chen SC. Journal of the American Academy of Dermatology. 2017; PubMed PMID: 28947282.
Review of reviews on exposures to synthetic organic chemicals and children's neurodevelopment: Methodological and interpretation challenges. LaKind JS, Anthony LG, Goodman M. Journal of toxicology and environmental health. Part B, Critical reviews. 2017; :1-33. PubMed PMID: 28952888. Psychometric Analysis of the Parenting Concerns Questionnaire in Women with Metastatic Cancer. Park EM, Tan X, Stephenson EM, Deal AM, Yopp JM, Rosenstein DL, Edwards T, Song MK. Journal of pain and symptom management. 2017; PubMed PMID: 28947143. Structurally Ordered Nanowire Formation from Co-Assembly of DNA Origami and Collagen-Mimetic Peptides. Jiang T, Meyer TA, Modlin C, Zuo X, Ke Y. Journal of the American Chemical Society. 2017; PubMed PMID: 28949522. Whole lung irradiation in stage IV Wilms tumor patients: Thyroid dosimetry and outcomes. Morgan TM, Danish H, Nanda RH, Esiashvili N, Meacham LR. Pediatric blood & cancer. 2017; PubMed PMID: 28960781. An intensive modular dermatology curriculum for family medicine residents in a resource-limited setting. McMichael JR, Thompson KB, Kent SC, Stoff BK. International journal of dermatology. 2017; PubMed PMID: 28960279. MST4 kinase phosphorylates ACAP4 protein to orchestrate apical membrane remodeling during gastric acid secretion. Yuan X, Yao PY, Jiang J, Zhang Y, Su Z, Yao W, Wang X, Gui P, Mullen M, Henry C, Ward T, Wang W, Brako L, Tian R, Zhao X, Wang F, Cao X, Wang D, Liu X, Ding X, Yao X. The Journal of biological chemistry. 2017; 292(39):16174-16187. PubMed PMID: 28808054. Purifying Properly Folded Cysteine-rich, Zinc Finger Containing Recombinant Proteins for Structural Drug Targeting Studies: the CH1 Domain of p300 as a Case Example. Kim YJ, Kaluz S, Mehta A, Weinert E, Rivera S, Van Meir EG. Bio-protocol. 2017; 7(17). PubMed PMID: 28966947; PubMed Central PMCID: PMC5621770. Clinical responses of patients with diffuse leptomeningeal glioneuronal tumors to chemotherapy. Aguilera D, Castellino RC, Janss A, Schniederjan M, McNall R, MacDonald T, Mazewski C. Child's nervous system : ChNS : official journal of the International Society for Pediatric Neurosurgery. 2017; PubMed PMID: 28965234. Diagnostic Utility of PD-L1 Expression in Lung Adenocarcinoma: Immunohistochemistry and RNA In Situ Hybridization. Gafeer MM, Hosny Mohammed K, Ormenisan-Gherasim C, Choudhary F, Siddiqui MT, Cohen C. Applied immunohistochemistry & molecular morphology : AIMM. 2017; PubMed PMID: 28968265. Nucleotide binding to ARL2 in the TBCD∙ARL2∙β-tubulin complex drives conformational changes in β-tubulin. Francis JW, Goswami D, Novick SJ, Pascal BD, Weikum ER, Ortlund EA, Griffin PR, Kahn RA. Journal of molecular biology. 2017; PubMed PMID: 28970104. Nuclear poly(A) binding protein 1 (PABPN1) and Matrin3 interact in muscle cells and regulate RNA processing. Banerjee A, Vest KE, Pavlath GK, Corbett AH. Nucleic acids research. 2017; PubMed PMID: 28977530.